Welcome to another edition of DC Mythbusting! This week we’ll be busting the myth of the term ‘lobbyist’. The legend that I’ve heard countless times in the District is that the term ‘lobbyist’ originated at the Willard Hotel when Ulysses S. Grant was in office (1869-1877). Apparently President Grant would frequent the Willard Hotel to enjoy brandy and a cigar, and while he was there, he’d be hounded by petitioners asking for legislative favors or jobs. It is said that President Grant coined the term by referring to the petitioners as “those damn lobbyists.” The legend has been forwarded by the Washington Post, The Hill, the American Society of News Editors, and, of course, the PR director of the Willard Hotel. It’s a fun story to tell tourists, and it makes the Willard Hotel even more of a landmark, but the legend is just not true. Sure, President Grant visited the Willard Hotel and enjoyed his brandy and a cigar, but he did not coin the term ‘lobbyist’. The verb ‘to lobby’ first appeared in print in the United States in the 1830′s, at least thirty years before Ulysses S. Grant came to Washington. The term is believed to have originated in British Parliament, and referred to the lobbies outside the chambers where wheeling and dealing took place. “Lobbyist” was in common usage in Britain in the 1840′s. Jesse Sheidlower, editor-at-large for the Oxford English Dictionary, believes the term was used as early as 1640 in England to describe the lobbies that were open to constituents to interact with their representatives. So there you have it: President Grant may have used the term to refer to all those hangers-on at the Willard, but the term was around long before he arrived in DC. shannon, i freaking love these. keep ‘em coming! We usually explain when asked, that Grant popularized the term “lobbyist” in the lobby of the Willard Hotel, as we have heard from several quarters — like from some over the pond — that the term lobbyist originated at the House of Commons. 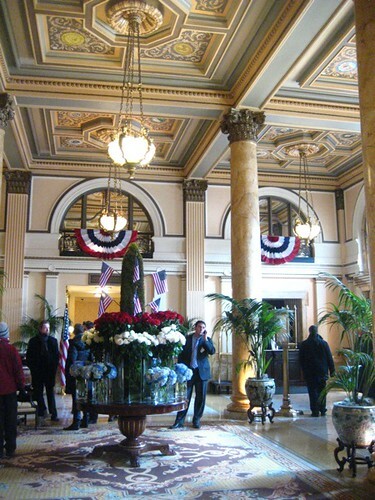 Either way, the hotel’s rich history is truly a microcosm of American History and certainly worth exploring. We invite readers to come visit our rather comprehensine history gallery near the F Steet entrance to the hotel. It is comprised of five thematic panels, a time line and glass memorabilia cases.